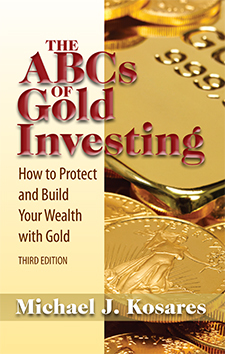 The ABCs of Gold Investing, 3rd Ed. The ABCs of Gold Investing is a solid resource for investors wishing to understand the benefits of private gold ownership. In this reader-friendly book, author Michael J. Kosares addresses the rapid changes in both the American and world economies and explains why gold is important to you as an investor. And, with forty years experience in the gold business, he can tell you how to add gold to your portfolio in a safe and economical manner.